It is not without a measure of sadness that we say goodbye to the warm summer days of 2015 and turn hopeful eyes to the return of autumn, new students, and a full schedule of academic work. As an instructional designer here at La Salle, many people from across the university have been contacting me about gearing up for the start of classes just a few short days away. Read on for a smattering of the technology questions that have been on people’s minds. If some of these topics resonate with you and you need help getting started, please don’t hesitate to reach out to the Instructional Design team at idteam@lasalle.edu and we’ll be happy to assist! 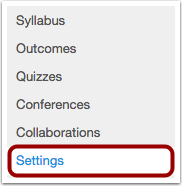 First, go to the newer course to which you wish to bring in the content, and click on the Settings link at the bottom of the left hand menu. On the settings page, click the button in the far right hand column that says Import Content into this Course. 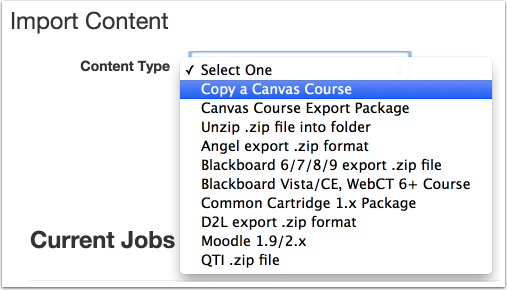 On the Import Content screen, select Copy a Canvas Course from the Content Type dropdown menu and then search for the course you wish to copy. 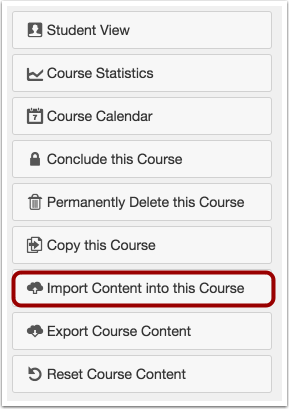 Once you have selected the previous course, you have the option to import All content from it or to Select specific content. Select whichever one you want. If you choose Select specific content, a Select Content button will appear below once you start the Import. You also have the option to Adjust events and due dates. Select this if you wish to either shift the dates or remove them. Leave it unchecked if you’d rather do this manually after the course copy. Finally, click the blue Import button and give it a few minutes. You’ll see a message that says Running and a progress bar will start to fill up. If it doesn’t seem to be working, first make sure you have click the select content if you choose that option. Then, try to click on to another page of the course to see if any content has been transferred into the new course. Is this finally going to be the semester when you make the switch to collecting and grading assignments online? Using the grading tools in Canvas can help increase the transparency in your course and reduce student questions about where they stand. For anyone interested in using the Canvas gradebook, the Assignments area in Canvas is the place to start. In order to get a column to appear in the Grades area, you must create an assignment AND publish it. Whether you plan for the assignment to be submitted in class or online, Canvas assignments can be set for No Submission, Online, On Paper, etc. Many faculty are looking for ways to increase efficiencies especially in grading assignments in Canvas. Did you know that you can import rubrics into Canvas, attach them to graded assignments, and then quickly grade student work by clicking on the cells of the rubric? To save faculty the time required to enter the rubrics into Canvas, I created a Rubric Repository in Canvas and pre-loaded over a dozen rubrics for various assignment types that faculty can transfer to their own courses. Once a rubric is in your course, you can modify it as needed and start using it to give clear, efficient feedback to your students. At this early point in the year, Canvas is ideal for sending welcome messages out to new students, but there is one HUGE caveat: Your course must be PUBLISHED! If you try to message students from the Canvas Inbox section, they will not appear until the course has been published. Similarly, if you post a course announcement, students will not be able to see it until the course has been published. Once the course is published and accessible, both the Canvas Inbox and Announcements are great ways to post messages because these messages also get pushed to students’ La Salle email addresses. For whole class communications, I prefer the Announcements tool because a record of the message is also posted in the Canvas course where students can reply to it. For messages to individual students or small groups, the Canvas inbox tool is more suitable. Do you have some best practices or technology tips to share with the campus community? Please reach out to us at idteam@lasalle.edu to share successes, ask questions, or get help with any of the topics mentioned in this post.